If you’re planning a camping trip, you shouldn’t have to cut down the list of who you are going to take with you just because of silly space concerns. While conventional tents can only sleep one or two people (perhaps three, if one of those is a child), a 6-person tent will allow you to bring multiple people along on your fun-filled camping trip. If you’re tall or simply like more room to move around, a six-person tent can be an absolute godsend. Consider the Coleman WeatherMaster 6-Person Tent with Screen Room. We believe its one of the better six person tents you can get with regards to price versus quality. 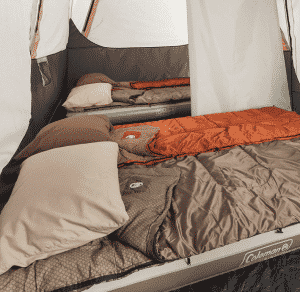 Coleman is the name to know for camping equipment, and this six-person tent offers no exception to the brand’s phenomenal reputation. As an affordable option, it offers plenty of space at a reasonable price. The tent itself is large, with a main room that measures a whopping 11 by 9 feet, with an additional screened in room that measures 6 feet by 9 feet. If you’re seeking even more space, Coleman also offers a ten-person version of this tent. This has enough room for three queen sized air beds and measures 17 by 9 feet with a 6 foot 8-inch center height. That said, the 6-person tent has more than enough space for you and all your gear, and is easy to set up, take down, and carry. This screened-in room offers added luxury and convenience, providing a space for your pet to sleep or for you to stash your gear. On a clear night, you could even have your children sleep under the stars in this room. 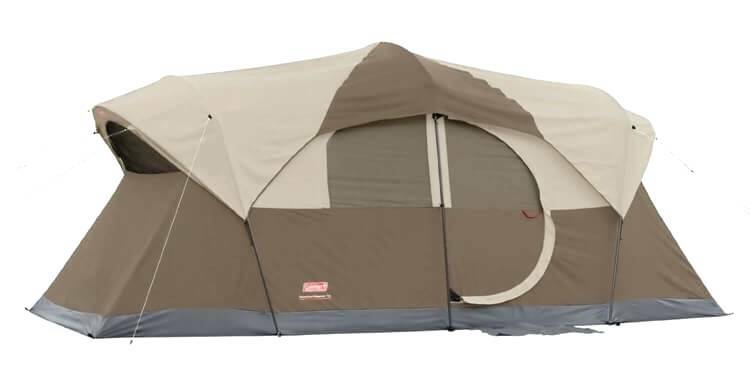 The tent comes in a beautiful – yet subtle – brown and tan color scheme, making it an attractive option for camping no matter where you are. It is designed with WeatherTec technology, which features a tub floor with welded corners. The tent has protected seams and covered zippers, which help to repel and keep out water. It also has an extra rainfly for added weather protection. The tent is constructed with durability and portability in mind. It is comprised of a fiberglass frame, adding minimal weight and set-up time. Most people claim that the tent can be assembled in less than thirty minutes. The tent has a polyethylene floor as well as an inner mesh lining, which helps protect you from the elements and also to guard against damage in all kinds of weather. Finally, the tent is equipped with an electrical entry port. Coleman is one of the few manufacturers that offer this option. What this port does is it allows you to connect all of your electronic devices from one easy access point, making it simple for you to tote lanterns, cell phones, and other electricity-requiring equipment into your tent. You don’t have to worry about having to leave a bit of your door unzipped to make room for a cord – this port does it for you. Still not convinced? Check out our list of pros and cons to help make the buying decision even easier. Customers appreciate the easy set-up and tear down process for this tent, made easier by color-coded materials. The pole sleeves are snag-free, allowing you to set up in about 20-30 minutes. 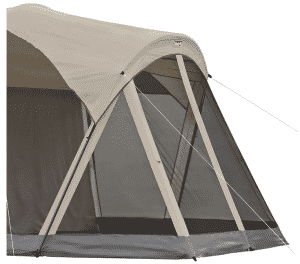 Coleman also offers a patented slip-proof pin-and-ring design in this tent, as well as an Insta-Clip suspension. This allows you to secure your tent to your poles quickly, instead of fumbling around trying to get them to fit. The resilience of this tent is also above comparison. The material is durable and guards against not only precipitation but also bugs. Because the tent is designed in an efficient manner to keep out water and cold air, its watertight design also prevents biting insects from entering the tent and keeping you awake. The Coleman WeatherMaster 6-Person Tent with Screen Room is, without a doubt, one of the best six-person tents you can buy. Offering maximum weatherproofing, comfort, and durability, this tent is a good option regardless of whether you are heading out for a backwoods excursion or camping in a suburban backyard. We review a lot of tents here on GoGomountain and the Coleman WeatherMaster 6-Person Tent most definitely deserves to be in the top 5 best 6 person tents. Buy it with confidence knowing you are getting true value for your hard earned cash.